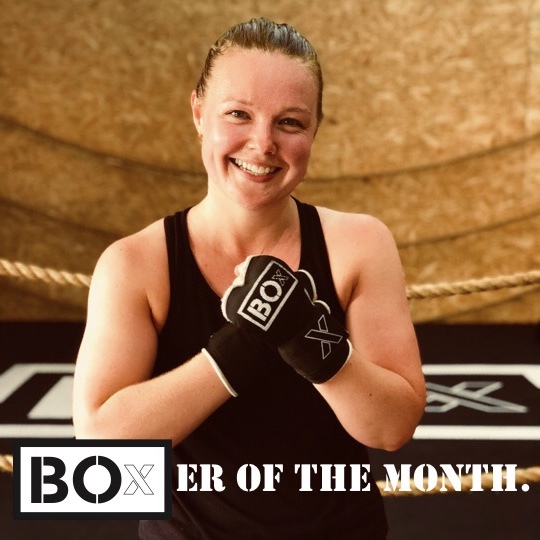 Our BOxER of the month in June was Jenna Holcroft. Jenna was an obvious choice for this month’s shout out, she has smashed our aqua bags more times in the last 2 months than I think we ever have! Jenna has clearly found her love for boxing and it’s a pleasure to see. Effort is her second name and the sheer fact that we see her twice a day at the studio just solidifies how much she enjoys her sessions. Fitness is about mind set and Jenna has included BOx as part of her day to day lifestyle and that’s why she’s seeing results. You want motivation – stand next to Jenna in class and you’ll push yourself even harder to keep up. Well done Jenna, great effort every time. The studio opened at a time when I was looking for something new – slogging it out at my old gym solo had started to get dull and repetitive. I had followed the BOx Loughborough posts on Instagram with envy, so when the Leicester studio opened it was a no brainer. So I tried out a couple of classes at BOx Leicester and absolutely loved it, signed up and haven’t looked back. I have never looked forward to working out as much as I do going to BOx and I think that’s the biggest lifestyle change – it doesn’t feel like a chore. I love the variety and the intensity; makes the 6.30am starts worth it! All you need to do is turn up, and you’re guaranteed to leave a sweaty mess!